Home » Blogs » Where are the shoelaces? Reflections from Girasol’s trip to the border in December. Where are the shoelaces? Reflections from Girasol’s trip to the border in December. 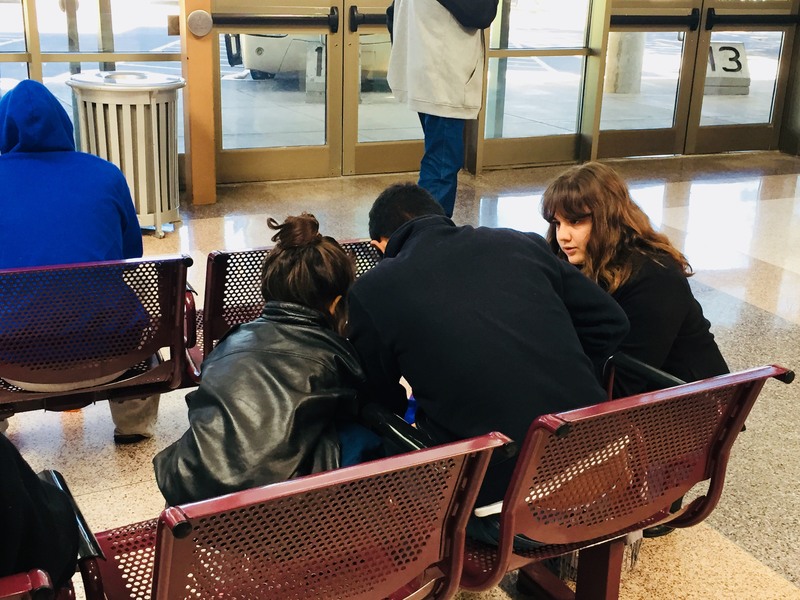 Our Girasol team and volunteers took our first trip to the border in December. 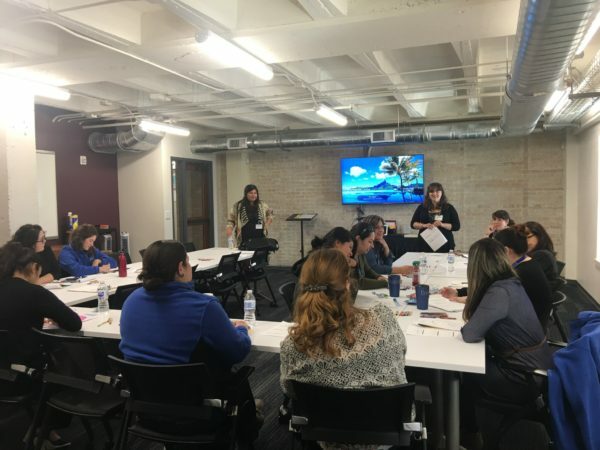 We trained legal and shelter staff at ProBar, staffed a bus station to ensure migrants knew where they were going, and we helped at the Catholic Charities shelter, which processes more than 300 people who come through the humanitarian respite center each day. Here are some reflections from our team. What’s one phrase or sentence that sums up your experience? Ana: Overwhelming need met with overwhelmingly generous support. Anayeli: No matter how big or how small anything helps! Monica: This was my second time visiting the humanitarian center. This is the place where border patrol brings people who are released from their custody. They literally bring buses of people (300-400) a day. We met a volunteer who is a retiree and works there each day. He goes to shake everyone’s hand as they enter the building. He smiles at every person and says hi to every baby. He reminded me of a very basic social work concept in the midst of feeling overwhelmed: relationships heal. Sometimes you just have to smile so people know they are finally safe. Esmeralda: The people who were being served at the humanitarian relief center had been through so much on their travels. It was easy to see they were absolutely exhausted and wanted nothing more than a meal, shower, clean clothes and rest for themselves and their families before having to travel some more, but they always returned a smile and friendly conversation. They were in good spirits and the people who were willing to talk to me showed so much hope and optimism for their future. The women in the clothing room joked and laughed with me and each other while their children played nearby. It was great to see that though they had been through such rough times, they were still able to smile and laugh. Ana: While it was disheartening to see the overall lack of systems and resources to adequately support families crossing the border and seeking asylum, I was incredibly impressed with the networks that have been created by local shelters and the Angry Tias y Abuelas RGV. They work so hard every day to bring supplies, volunteers, and a supportive presence to migrants. I felt that our contribution was meaningful, but it was also good to know that others would take our place once we left and that the migrants we worked with would soon be reunited with family in the United States. Chrissy: What most surprised me was how deep our conversations went with the ProBar shelter staff. While they already knew a great deal about trauma from their work and other presentations, they were incredibly engaged in learning new material, especially when it came to the connection with child development. I think for anyone on the front lines working with asylum-seekers having spaces to talk about your experiences, feelings, and frustrations is VITAL. I enjoyed helping to cultivate that space during our processing groups. Anayeli: I was really surprised that people were not getting any medical screenings before being released from border patrol. I clearly remember a father with his kid who came to us looking for shoes, but his child had a bald patch on his head and when asked what occur the father said he got bit by a spider. Medical volunteers at the Humanitarian Center acted quickly to get this child medication. There is a very real need for medical help. Monica: Control. At the respite center, I wanted order so that everyone got what they needed. I am fine with chaos as long as I control it. Without that control, it is hard to walk away at the end of the day because it feels like there is still so much unmet need. Esmeralda: While the humanitarian center provided so much, there were still many people left wanting. There were not enough jackets, kids’ clothes and stuffed animals to go around, so it was important to assess individual needs and only give certain supplies to people who seemed to need it most. Only some children got stuffed animals because there just were not enough. It was very challenging for me to say no to anyone, but it was necessary. Ana: The most challenging part for me was knowing when to stop for the day. The work at the bus stations and in the shelter is endless. There is always another person to talk to, to orient toward their final destination, to help find some shoes. Knowing how to determine when I had spent my own energy and needed to rest for the day was difficult, particularly in the midst of seeing such high need from both the shelter and the families. I had to trust that other volunteers were on their way and know that this system functions every day without us. All the same, making the call to leave was difficult. Chrissy: What most challenged me was when we ran out of supplies to give at the Respite Center. I found it especially difficult to tell asylum-seekers, many of whom are going to cold destinations on multi-day bus trips, that we ran out of coats. I am from Boston, and imaging the trip there without a jacket was very difficult, especially as many of the asylum-seekers were already sick. Those who run the center every day must strike a very difficult balance between giving everyone what they need, and knowing there won’t be enough for everyone. Those who are able to donate to the Respite Center should know that what they give is very, very, needed. 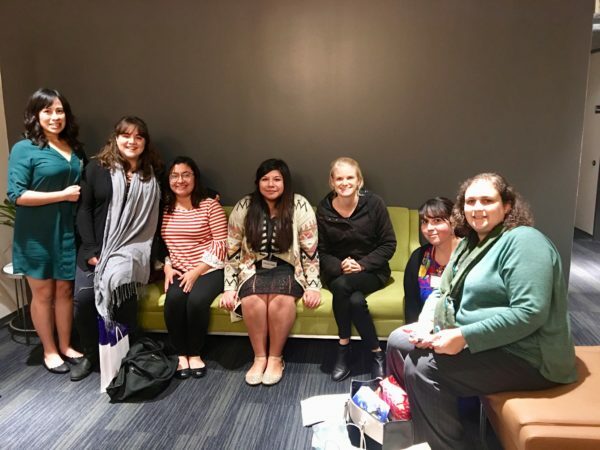 Anayeli: Despite knowing that I am knowledgeable in migrant experiences and feeling comfortable in what I knew, I was there to help and not fix problems. I think as social workers we sometimes have the urge to “fix” things, and with a crisis this big there aren’t many sustainable solutions that could help alleviate the chaos. What unanswered questions do you have? Monica: Where are the shoelaces? Border patrol takes people’s shoelaces when they are processed at the hielera and people don’t get them back when they leave. Catholic Charities has boxes of shoelaces to give migrants after they are released because they come into the respite center with shoes flopping around their feet. I can’t help but imagine there is a room at the border patrol facility that is filled with shoelaces. Esmeralda: I wondered how much the humanitarian center paid for the shower trailer and if that money might not be better spent fixing the existing toilet and shower facilities inside. I also wondered about the security as far as accepting volunteers. These populations being served are vulnerable and accepting anyone who comes in to help seems dangerous. Ana: How much money would it take to fully and adequately support shelters, such as the one we volunteered with, along the border? I spoke with a man who works at the Catholic Charities shelter and informed us that the building (a former nursing home) had 15 toilets, but that the plumbing needed to be repaired. I wondered – with all of the tens of thousands of dollars pouring into private detention companies, what small percentage would it take to ensure that all migrant families had a decent place to sleep and use the bathroom, as well as the items needed to ensure their comfort (jackets, shoes, sanitary items, etc.) What would it truly take to address the needs of these families fleeing violence and oppression in a humane way? Chrissy: How asylum-seekers get to their destinations. When assisting the asylum-seekers at the bus stop, I was shaken by how little help they sometimes receive to understand the journey ahead of them. Most were taking bus routes that would be difficult for anyone to navigate over several days, with several changes, up to 30+ stops and several hours of waiting in between. For someone who is exhausted, sick, has very few possessions to sustain them, is traveling with children and does not speak English to finally make it to their destination is almost miraculous. My hope is it speaks to the kindness of strangers along the way, and it certainly speaks to the resilience of the asylum-seekers themselves. When they finally see their sponsors, it must be a huge relief. While this system is not perfect, it does also beg the question of why we detain asylum-seekers for long periods of time rather than releasing them to sponsors from Processing Centers, as happened with those we worked with. Anayeli: So at the bus stops we explain to migrants where they are at, to follow up with their immigration appointment, and ask if they need anything on their journey. We noticed children arriving without jackets at the bus station and mothers carrying only 2 diapers to last 3 days. With so few resources and volunteers, I wonder how agencies can better communicate with one another in order to be more efficient in spreading resources.